If you are like me, then you have bows but no strings. 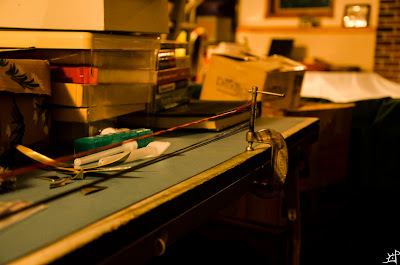 If you are also like me, then you have had bows without strings for several months. 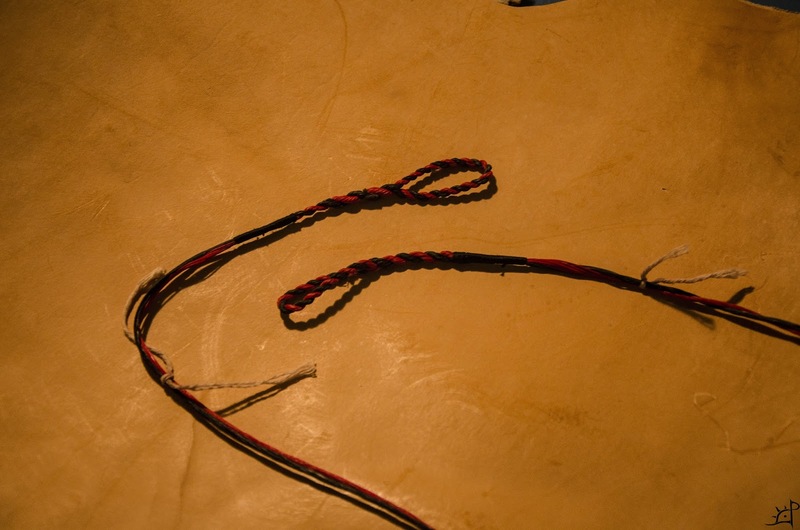 As this is generally useless, I decided to finally get around to making a few strings for them. There are a few different ways this can be done, so I decided to ignore all of them and invent my own. 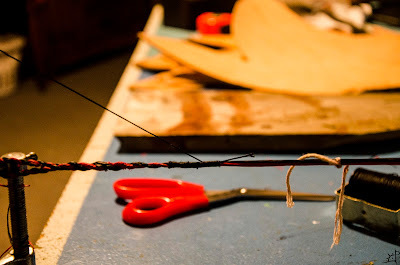 In the following post, I will be making a simple bowstring with a Flemish loop at each end. The first step is to take a bow or the dimensions for a bow and determine how many strands and how long the string needs to be. I have no experience with this, so I found it online. The number of strands will likely vary with what string material you are using. 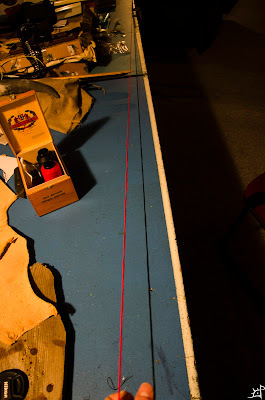 I have B-50 string material, and for the bow in question (~35-40#) I will be using 14 strands, seven each of red and black. Only one colour is necessary, but it is easier to see what I am doing with two. With that done, I took the length of my bow and added 10 or so inches to accommodate the loops and shrinkage due to twisting it. To hold everything in place, I took two C clamps and fastened them to the edge of a table with the screw end up. I tied one end to the screw and made seven passes with each colour, for a total of 14 strands. Keeping the two halves separate, I cut off the loops from one end and made the end tapered. To do that, I simply cut the seven strands at an angle so it faded more gradually. This is not critical, but will make it easier to handle later. Do the same thing with the other 7 strands. Now, I took each bundle and twisted it slightly to the counter clockwise direction. This was merely to keep it from falling all over the place and tangling with itself. I went that direction because it will unwind with the twisting of the Flemish loops leaving a nice neat and straight bundle later. NOTE: from here out, you can do this with either orientation, but if you do it the other way, you will need to do everything opposite what I am doing. 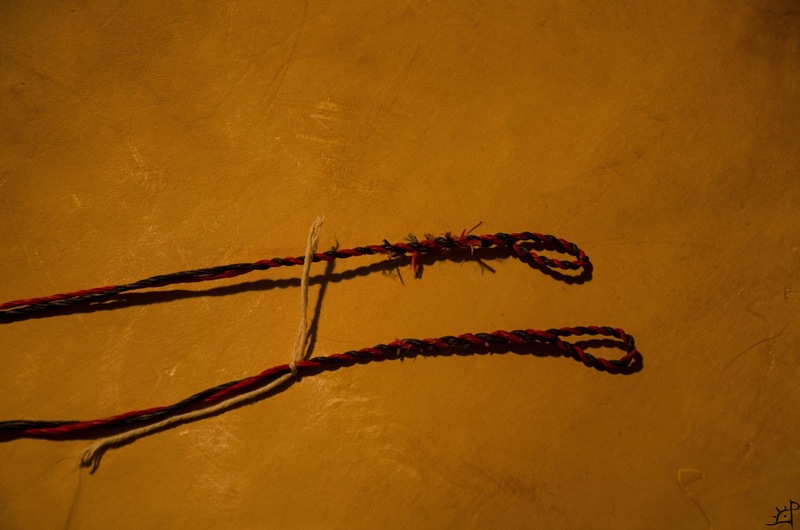 Both bundles in your left hand, with the tapered ends off to the left (you are working to the right), take the topmost and twist it with your right hand by rolling it between thumb and fingers. Twist it away from you so it looks like mine. The direction of twist here is important, for if you do it the wrong way, the Flemish twist will not work. It will be quite obvious if you do it wrong, as the thing will not stay together. Holding the twist in the string with your fingers, bring the top strand down over the bottom so it crosses in front as you see it. Careful to keep the first bundle from untwisting, take the second (black, now on the top) and do the same thing. Twist out and away from you and bring it down over the first (red). 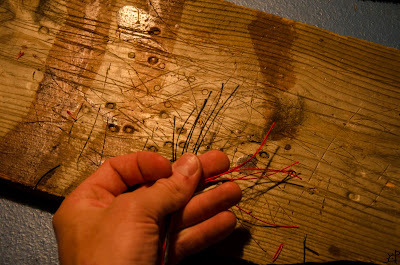 If you are curious about what is going on here, take any piece of string and twist it a lot. That is, until it starts to buckle and form a corkscrew shape. That is essentially what is happening here, except we have two of the screws and are interlacing them. 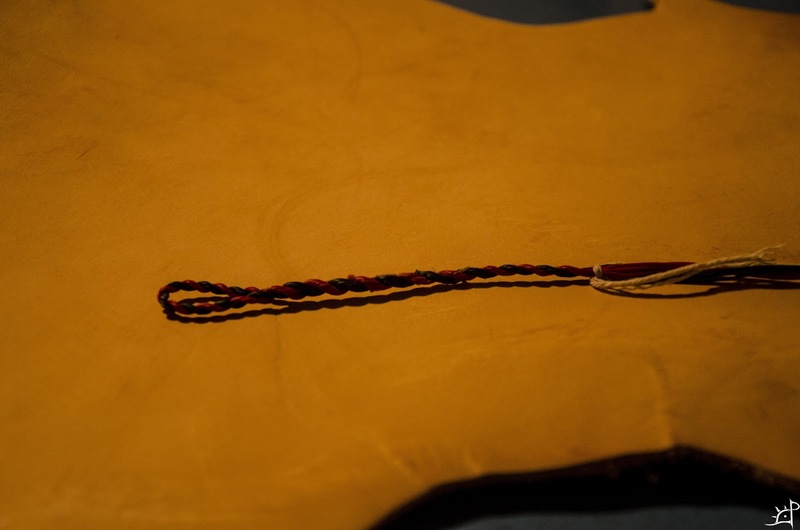 The twist from your fingers brings the string to fit against the other, and working them progressively keeps it from creating ripples and errors that compromise the string. Continue to do the same thing, twisting the top string and bringing it down over the bottom, until it begins to look like this. Depending on how tight you want the turns, you can pull the top bundle farther over the bottom or leave it farther out away from the anchored end. 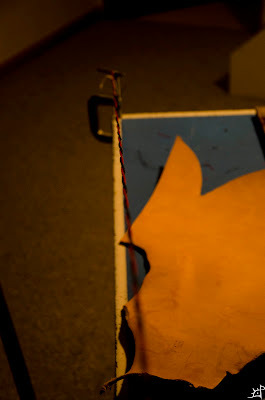 I tied a string around the free end to keep it from being worked loose, but it will stay together naturally. After all, that is the whole point of the Flemish twist. 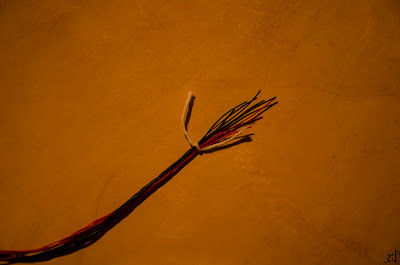 If you have any question as to how much to twist the bundles between your fingers, it is better to have more than less. 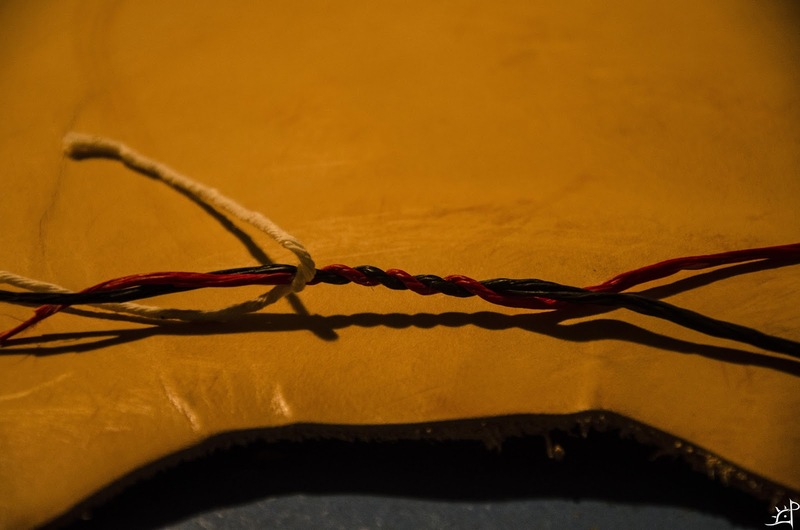 Releasing the strands will allow them to untwist a little, so a heavier twist later will help reset what is already inside the Flemish part (two wrapped together). Depending on how thick your bow is will determine the next step. To form the actual loop, you need only as much Flemishly twisted string as will fit around the nock of your bow. Mine was about 6cm long at this stage. 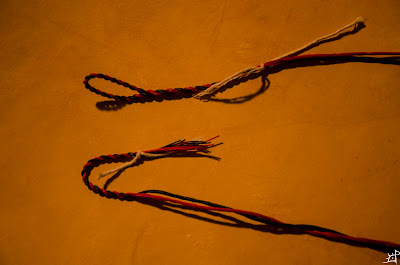 Fold the newly twisted string in half as shown so the two untwisted ends align. This is where having two colours makes it easier. Take the two red ones and pull them together, then the same with the black. This will leave the string with half of the ends on one side, half on the other. If this is confusing to describe, just look at the above picture. Take the reds and work them together into a single bundle as shown, same with the black. Begin to do the same thing as you did in the start, twisting the top out and away and pulling it down over the bottom to the front. Rinse and repeat. To determine how far down to go with the Flemish loop, I went about 3cm past the bottom of the fade. You will be able to see where the longest end was by where it sticks out from the twists. Those are nothing to worry about, as they can be cut off later. 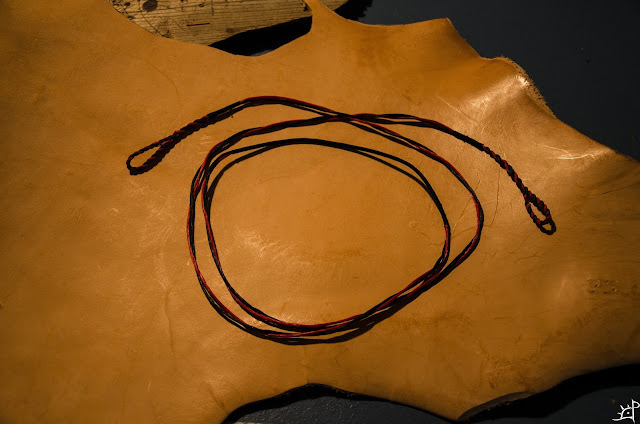 You should now have a Flemish loop. I tied mine off with a bit of string to keep it nice and tidy while I do the second. 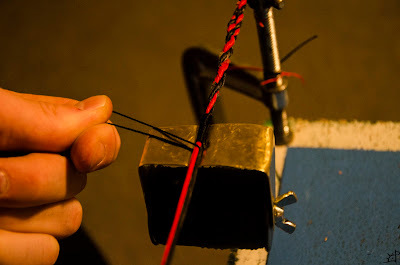 At this stage, you will need some indication of how long the string actually needs to be. A recommended to me approximation is the length of the unstrung bow from nock to nock, less 3 inches. I did not do this. Instead, I took a piece of synthetic rope I had been using until now as a string and simply measured it. I knew it was the proper length, so no harm there. Be wary of this, however. 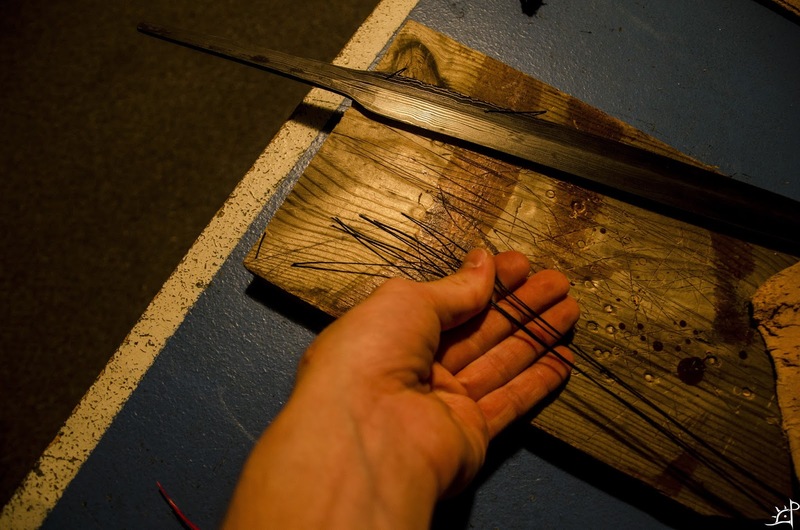 Some materials will stretch under tension, and for that method to work it must not. 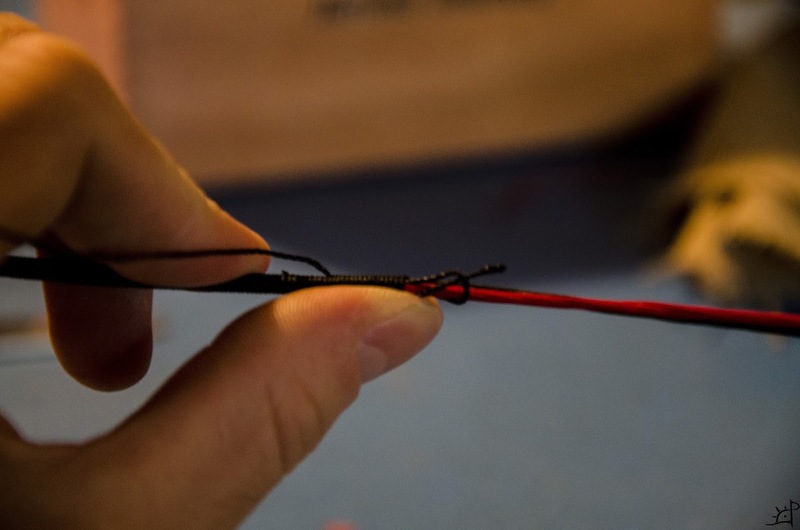 A strung bow should have the string approximately the length of your fist with thumb up from the handle to the string, more or less depending on your preference. Or, more accurately, the bowyer's preference. 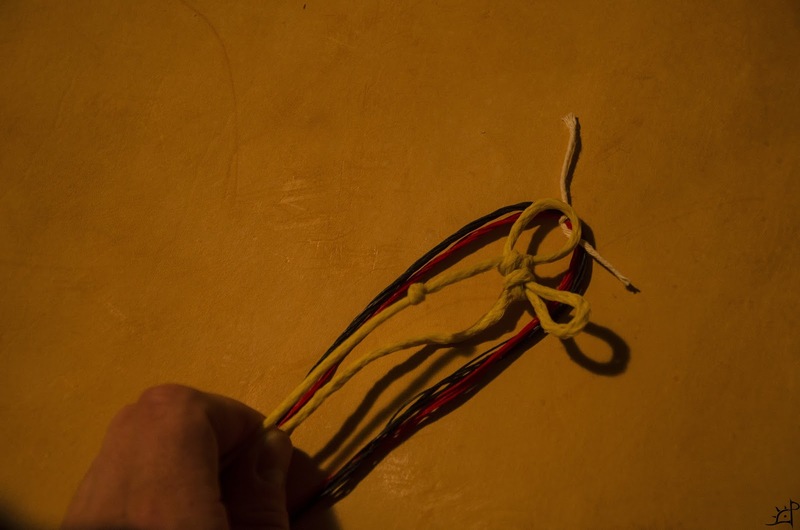 So, I took the fake string and used it to find the top of the second loop and tied it with a string. Cut the strands same as before, tapering them nicely. 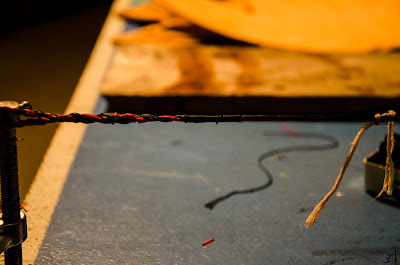 I probably should have mentioned this before now, but bow string material is waxed. If it ever stops sticking together after a little effort, re wax it with something. (Beeswax? I have not yet encountered this issue). I cut the bundles so that they were only long enough to make the loop with the fade into the rest of the string. Much longer, and it will be a mess to try and fix later. 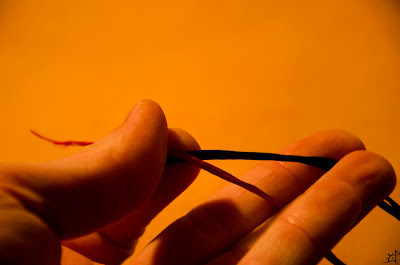 An estimate of this length can be found by laying it next to the first loop and trimming accordingly. 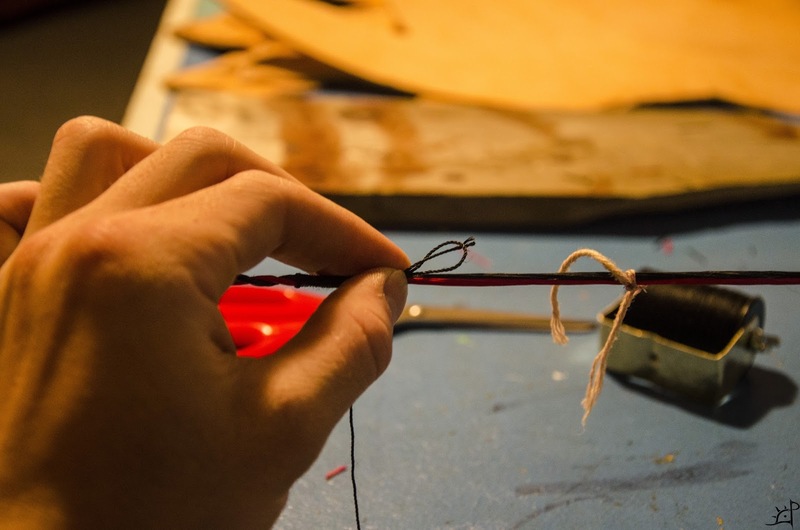 At this stage, I moved the string up to the top of the fade (where the loop will intersect with itself) and did the same thing as with the first loop. 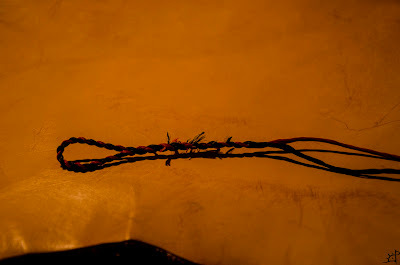 Note: the string will accumulate some twist to it, because the bundles cannot untwist freely due to the loop at the other end. 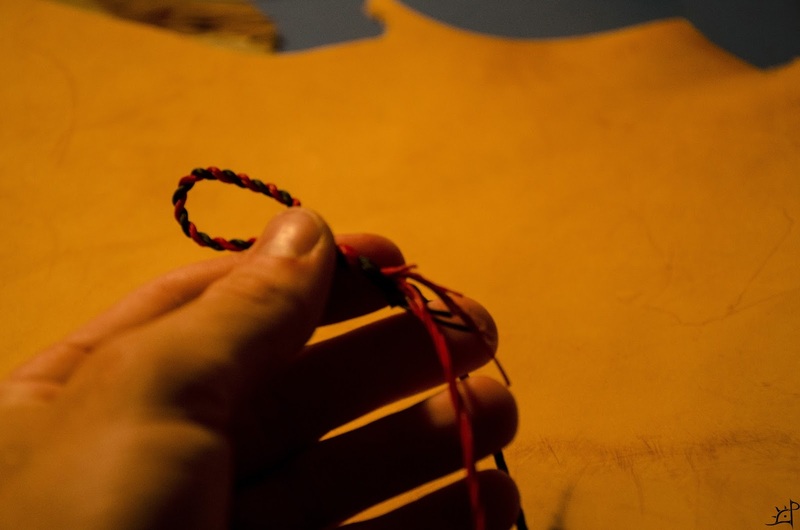 If you did not notice this before, the strings will accumulate twist from rolling them between your fingers. Do not worry about it, as it will help keep the string together. For whatever reason, the twist from the second loop is in the same direction as that from the first instead of opposite. If this makes no sense to you, simply do not worry about any of it. Proceed with the loop as though there is nothing wrong (because there is not). With the second section as long as the loop it will become, I folded it in half just as before. 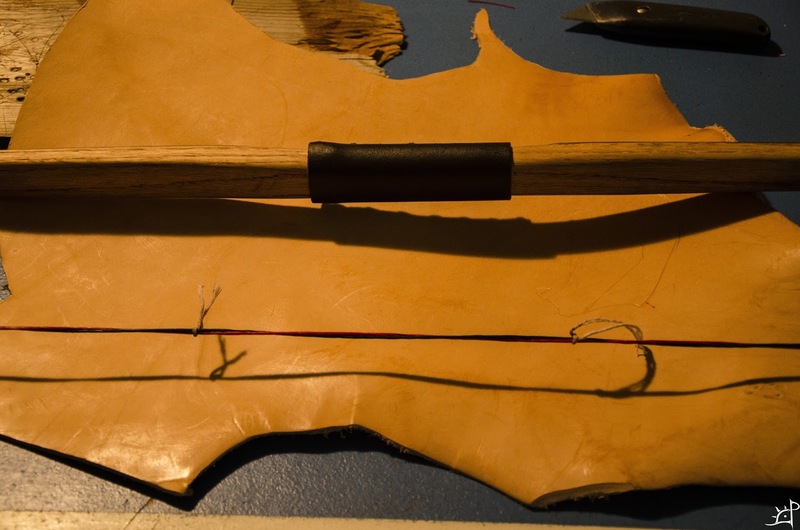 The loops are slightly larger than the bow at the nock, as it needs to slide down onto the body of the bow to be strung. This picture represents a little more clearly what I meant about separating the two colours when joining the loop. Red to red and black to black, turning the four bundles into two, one of each colour. Now do the same thing to finish the loop. Here are the two loops side by side, the first trimmed and nice. Both are the same size. But we are not done yet! See the internal twist? This is the product of the Flemish loops. Nifty. Serving. That is the last step before you can finally go shooting. You will need serving (obviously) to do this. Also, not required but highly recommended, is a serving jig. I made mine in about five minutes from a piece of scrap. Or you can buy one onlie. I will make a post about that later. 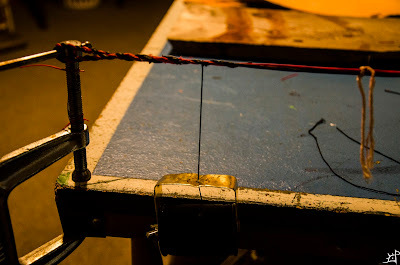 Here, I returned the string to the clamps to suspend it. There is enough tension to keep it from sagging, but it is not super taught. BEFORE starting to serve the string, cut a ~10cm piece of serving off and set it to the side. To start, thread the serving between the two bundles and bring it to the end of the Flemish twist. Tie a knot if you want to. Or don't. It does not matter much. Start for real by bringing the working end of the serving about 2cm in from the end of the twist. The idea here is twofold. 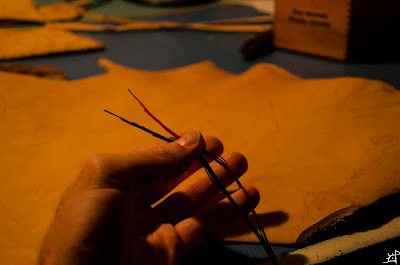 One, to cover the ends of the taper if you did a bad job of cutting them off or chose not to altogether. Two, to cover the transition from twist to straight. 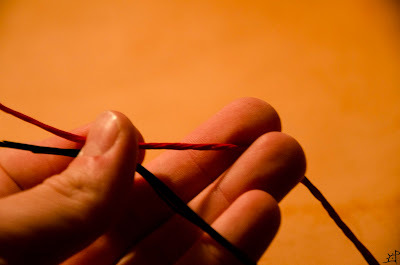 Serving this part of the string is not essential, and many I have seen do not, but it took only a few minutes so why not? 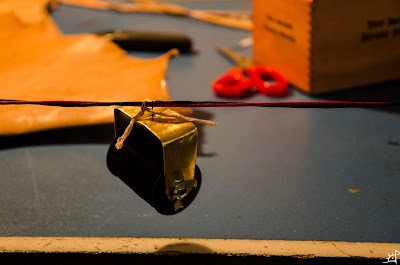 Roll the spool of serving until the groove of the jig rests against the string as shown. Now just spin it around the string. 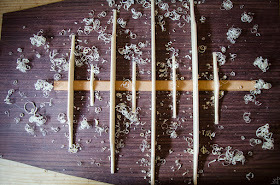 Doing this by hand may leave gaps in the serving, but there is something magical about the jig that keeps it perfect. No smoke and mirrors here. 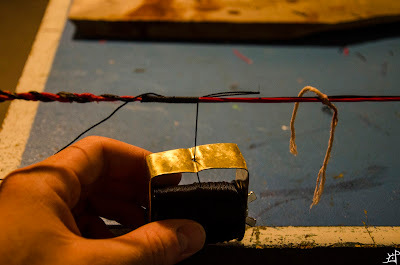 I held the non-clamp end of the string to keep it from twisting, and just spun the jig around as fast as I reasonably could without it flying off. I recommend having your serving jig tightened around the spool (by that bolt that keeps it in the jig) enough that it will not unwind under its own weight but not so tight it takes more than a little effort to wind around the string. It is one of those things that is easier done than said. 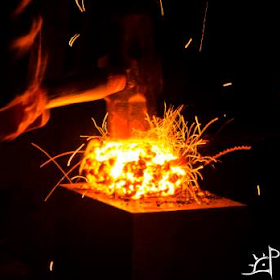 Experiment around for yourself until you find the sweet spot. Finishing the serving must be taken into account before you are ready to end it. Take that ~10cm piece of serving and put one end along the string so the next wrap of the serving goes over it and holds it in place. Fit it into the small gap between bundles or don't, your choice. Now wind the serving around the three strands (red, black, and serving you just put in) for five or so turns. 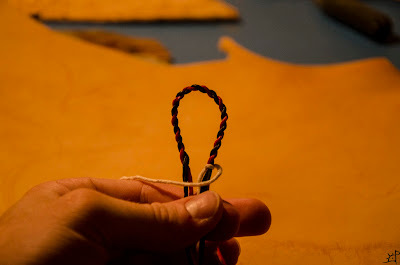 Now take the other end of the 10cm string and fold it over to form a loop. Leave the loop large, but overhang the free end back towards the Flemish loop long enough to grab onto later. Wrap it up with everything else for another five to seven turns. Any more than that, and the waxed bowstring will have provide too much friction and the serving will snap. 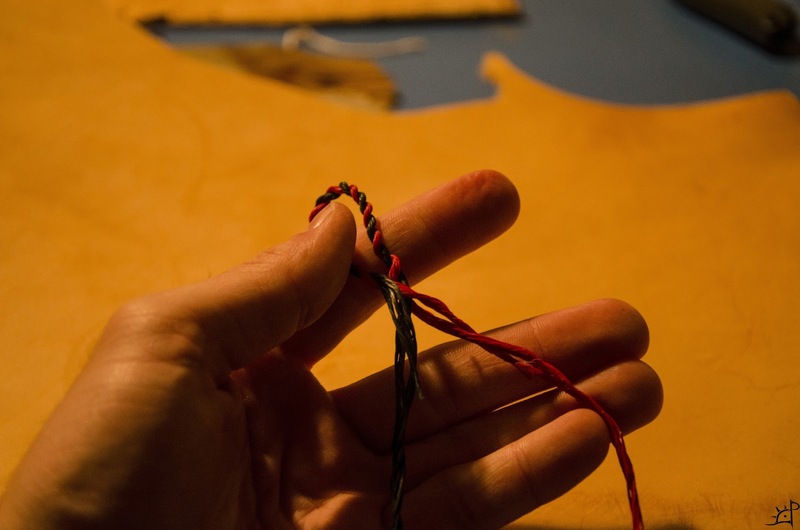 By now, the middle of the serving you wound around the string should be about on the transition from Flemish twist to straight string. If not, as long as it is covered you are alright. 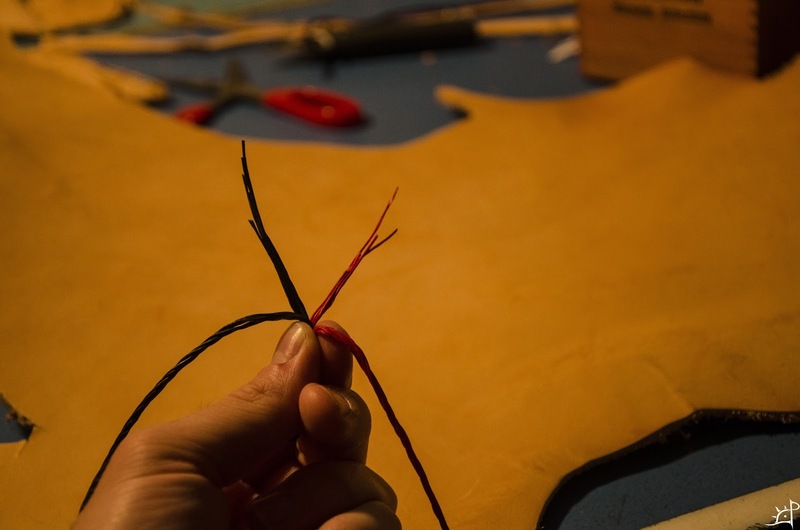 Pull the serving jig down to unroll some thread. Pinch the string at the end of the wound serving and cut the spool/jig free. Be careful not to let everything you have worked to do unravel. Push the cut end through the loop you made earlier as shown, still keeping everything held in place between the fingers of your other hand. Pull the long end of the serving loop towards the Flemish loop until it comes tight against the end of the serving wrap. Now pull it a little farther so it is underneath the serving. Cut it all free, and you are a third of the way done serving. Nearly done. With both ends served, all that remains is to serve the nock. This is the most important area to protect, as the nock of the arrow will wear the string very quickly if left unprotected. Remember to cut your extra piece of serving!! 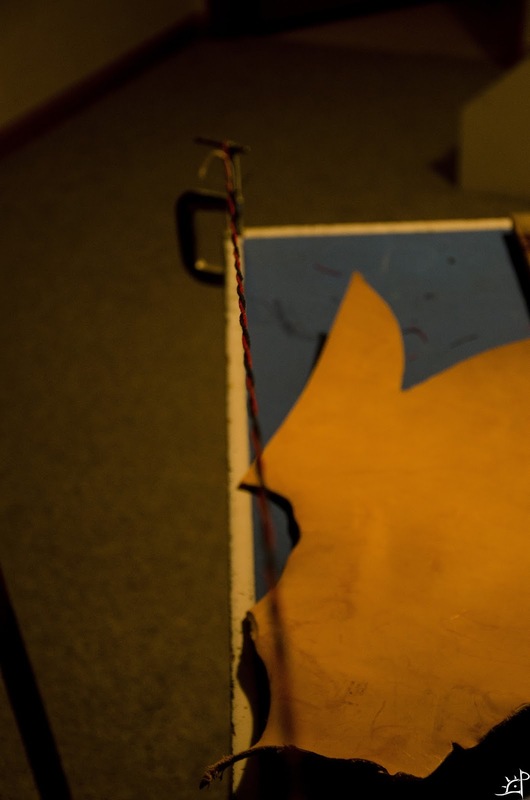 For this, we need to actually string the bow. The reason being, we need to know where we need to serve. I mark the area with those handy pieces of string that were left on from before. The top (left side) is 7cm or so above where the arrow shaft will rest when drawn. 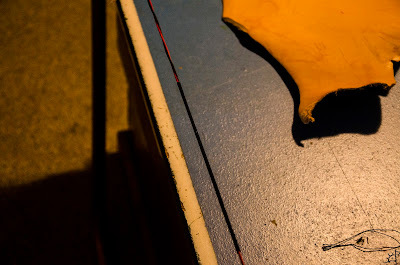 The bottom (right side) is about the same distance below the bottom of the grip. You want to go that far down because the string wears equally as fast when slapping against an armguard. Also, if you string it upside down, you will not be shooting off of unprotected string. 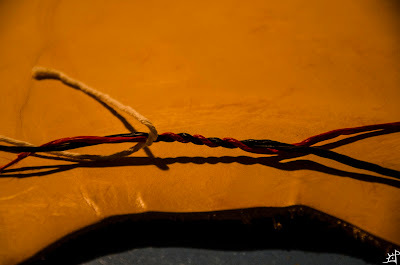 Start by tying the serving to the string, same as before. Take it as slow as you need to. 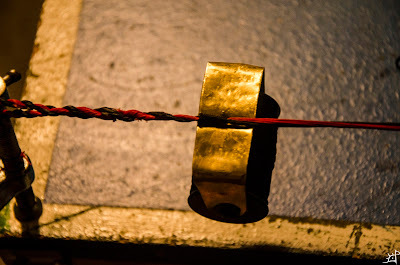 One thing that I would do at this point is even out the internal twisting of the string. If one half is almost straight and the other very twisty, push the twists to the barren area and even it out. This cannot be done easily after the centre is served. (There are ways around it, but it is not quite the same). Finish with the same loop and pull method as before and trim the excess serving. And now the string is served. 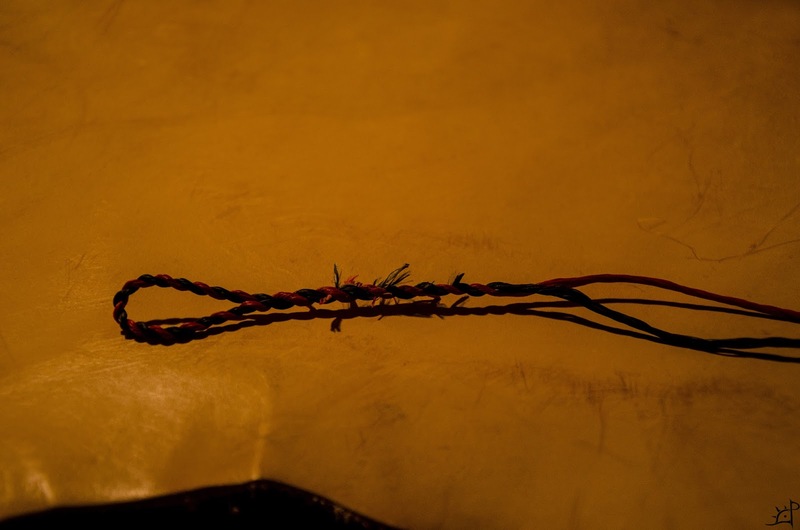 There you have it, one string ready for use. The total time took me about 40 minutes ,including taking the photos.